RWABhagidari - RWAs Online News Channel: Why don't we elect the representatives on the qualitative lines ? Why don't we elect the representatives on the qualitative lines ? Life goes out of gear at almost every downpour in the city. The so-called sewer lines, that were laid some 40 years ago have become choked & hence null n void. But there is none to care for the national capital and residents face severe hardships every monsoon with knee-deep water, potholes, etc. It is the most Polluted city. It is the most congested city. Encroachments all over. Traffic Jams have become a part of the life. Large uncontrolled Landfill sites and open Dhalao in every locality are responsible for the woes of the residents. 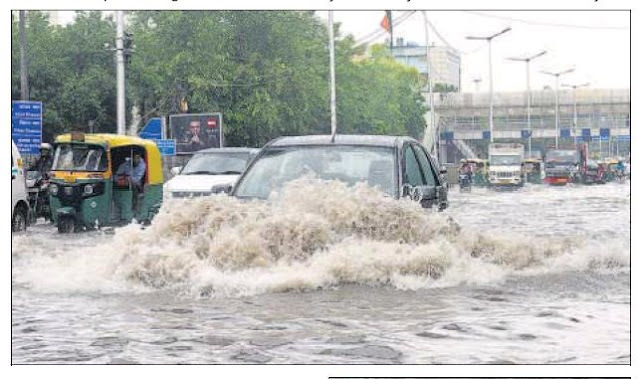 If this is the status of Water Logging in Delhi, Can you guess which Civic Agency is working for the City, seriously? The question is that how long this will continue? When the voters will come to their senses to elect the representatives on the qualitative lines.